It’s that time of year again — cold & flu season… In case you’ve missed the news, the CDC has predicted that the flu season is going to spike in February this year, which is actually later than usual. So now is the time to really start being diligent about preventing these nasty viruses from making their way into your homes (if you aren’t already). My kids might call me a little OCD, but we’ve done the whole “passing a virus around multiple times before finally kicking it” thing one too many times in the past. I’m ALL about PREVENTION these days! But I’m NOT all about using harsh chemicals to do so. We use a number of common sense tactics and a few easy natural tricks (including a surprisingly simple homemade disinfectant!) to stay ahead of the cold & flu season. They’ve been remarkably effective, even with our larger than average household. Want to save money and take control of your health this cold and flu season? Getting back to basics with these tips will give you a strong starting point. WHILE YOU’RE AT IT, LET’S BE FRIENDS! FOLLOW ME ON PINTEREST FOR MORE EASY DIY IDEAS. Studies show that staying active can cut the risk of contracting a cold by 50%. And if you do come down with the sniffles? Typically the severity of your symptoms is far less. It’s well known that exercise is very effective at improving your immune system, so treating exercise like a prescription is great motivation to squeeze in a daily workout. Daily fatigue takes its toll on our bodies in a number of ways, not the least of which is an impaired ability to fight off an attacking virus. So many of us are fanatical about ensuring that our kids get enough rest every night, but we’re not so zealous about our own bedtimes. Believe me — it’s a daily struggle for me, as well. I’m naturally a night owl, but I’ve slowly been trying to reset my internal clock towards an earlier bedtime. Diffusing lavender essential oil at bedtime has been an effective way to indicate to my body that it’s time to wind down for the night, and I really feel like I sleep more deeply when using it. Are you surprised that I said vitamin D and not vitamin C? It turns out that vitamin C provides minimal extra protection against contracting cold and flu. But vitamin D, on the other hand, has been shown to contain an effective antimicrobial agent capable of killing bacteria, viruses, and fungi. Vitamin D is not naturally present in many foods. Our biggest source is through natural exposure to sunlight, but during the gray and gloomy days of winter, we’re probably not producing an optimal supply. So adding this supplement with an immune booster healthy citrus smoothie each morning could help ward off cold and flu viruses. A no brainer, yes, but washing your hands well and often is one of the most effective ways to prevent the spread of cold and flu. And skip the antibacterial hand soap! It’s completely ineffective against these viruses. A good scrub down with a gentle non-toxic hand soap is sufficient. By the way, it’s estimated that up to 95% of American don’t wash their hands properly. It takes 15 seconds of vigorous scrubbing with soap to wipe out germs. It starts with, wait for it… VODKA! 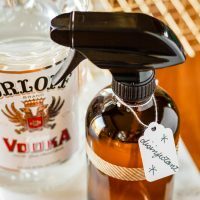 In fact, I use vodka over vinegar in many of my homemade cleaners. It’s virtually odorless, while still having effective natural disinfectant properties, and it’s actually very inexpensive. You don’t need top-shelf vodka — just pick up the cheapest bottle of 80-proof vodka you can find! 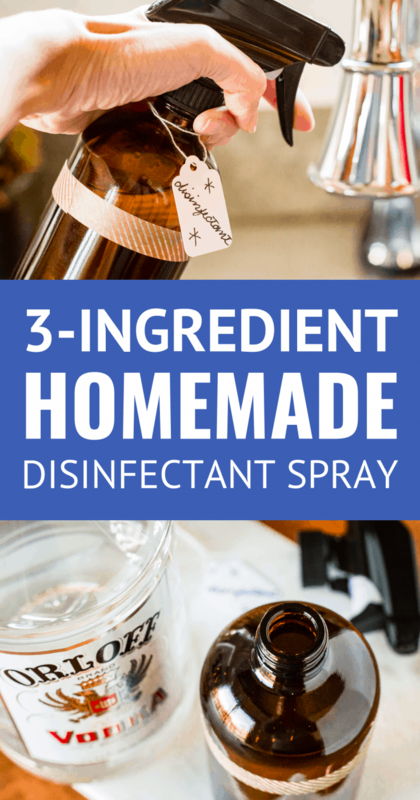 Making your own natural disinfectant spray is really super simple. I don’t even measure the ingredients — I just eyeball everything! A one-to-one mixture of vodka is the base, and then you can choose from several combinations of essential oils to boost the effectiveness. PIN IT NOW! 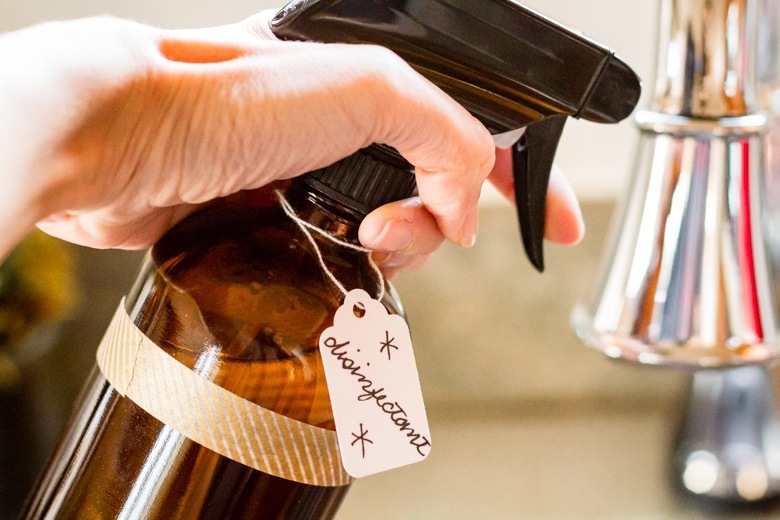 CLICK HERE TO ADD THIS HOMEMADE DISINFECTANT SPRAY TO YOUR DIY & CRAFTS BOARD ON PINTEREST! This simple homemade disinfectant spray helps keep cold & flu viruses at bay. All you need for this natural disinfectant are 80-proof vodka, distilled water & essential oils! 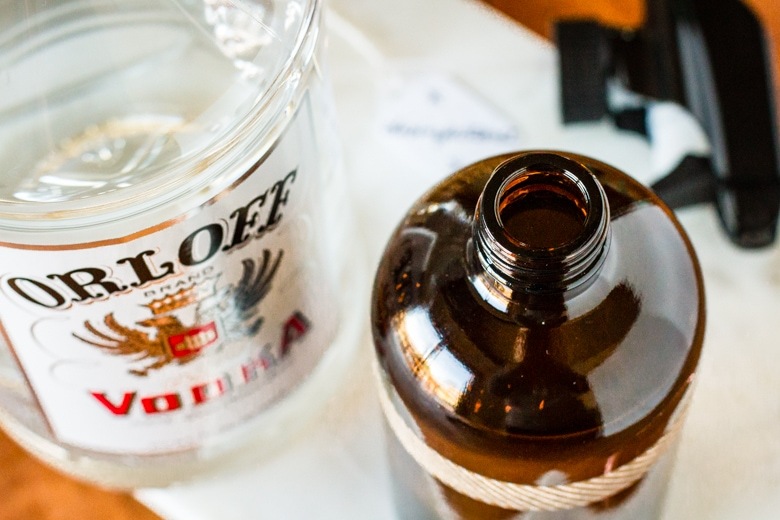 Using a silicone funnel, fill your glass spray bottle halfway with the distilled water, and then fill it the rest of the way with the vodka. Add your favorite disinfecting essential oils until you’re pleased with the scent. I used about 15 drops each of tea tree, orange, and peppermint. Check the post for additional effective combinations. Add a generous pinch of epsom salt to help keep the mixture combined. You can skip this step, but you’ll want to be sure to shake the bottle vigorously before spraying. Spray the mixture liberally on any surface that needs disinfecting — sink handles, door handles, and countertops are all good places to start. The spray should evaporate fairly quickly on its own, so there’s really no need to wipe the surface dry after applying. Note that I do recommend using a dark glass spray bottle if at all possible. I know that clear spray bottles are so much more aesthetically pleasing, but some essential oils are sensitive to light, so I always err on the side of caution. Vodka and water are pretty good at disinfecting on their own, but a pleasantly-scented spray is way more likely to be used in my household. So I add various essential oils to my homemade disinfectant spray for both aroma and added disinfecting properties. While all of these essential oils have natural disinfectant properties, tea tree oil (also known as melaleuca alternifolia) is especially high in antifungal and antiseptic properties. Because of this, I chose to include it in my homemade cold and flu season disinfectant. However, it does have a strong medicinal scent, so I actually paired it with two other oils — peppermint and orange. If you’d like to use the same combination, I found this 5-bottle essential oils set which includes all three essential oils I used, plus lavender and eucalyptus! Ugh, I still came down with a nasty cold or flu! So what do you do when you STILL come down with a nasty cold or the flu? Well, to be honest, it happens — unfortunately, no preventative strategy is a hundred percent effective. Make yourself a big batch of homemade chicken soup, add some fresh or ground ginger to your immune booster healthy citrus smoothie, and drink plenty of hot tea with honey, while taking comfort in knowing your symptoms are probably less severe because you’ve been exercising regularly, ahem. 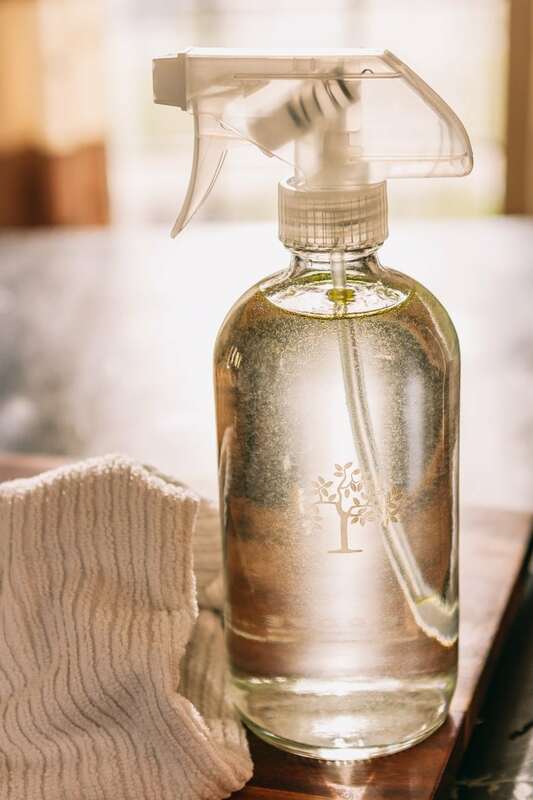 If you like this homemade disinfectant spray, I think you’ll also adore my favorite homemade glass cleaner. It’s truly the best dang homemade glass cleaner you will try — easy, streak free & non-toxic! 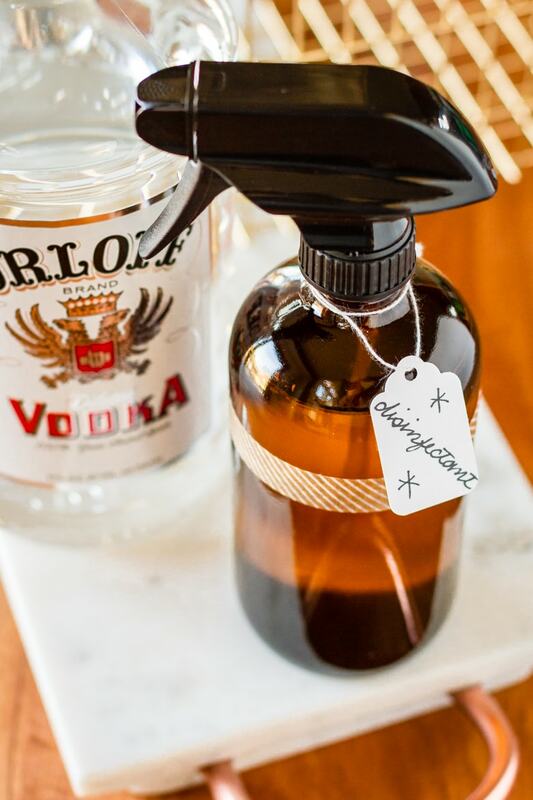 cI’d love to see your homemade disinfectant spray in use… Tag me @Unsophisticook on Instagram or use the hashtag #Unsophisticook so I can check it out. Enjoy! Could you use everclear instead of vodka? Hi Shannon! Yes, you could use Everclear if you want. You could actually use half the amount, because Everclear is 190 proof.